Notes The track takes place between the windmills. 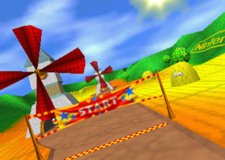 Windmill Plains is the first area in the Dragon Forest area of Timber Island in the games Diddy Kong Racing and its remake, Diddy Kong Racing DS. The track requires 16 balloons to be unlocked, although 23 balloons are needed to unlock its coin challenge. This level is notable for its many windmills, which serve as obstacles throughout the stage. The track has a country theme, and it is surrounded by bright green mountains. The road is mostly flat and there are a few long tunnels that can be found in the race. Some areas of the track are also surrounded in water, so players driving in cars have to be careful. Luckily, the track's standard vehicle is the plane, so racers can usually just fly over the watery areas. The beginning of the track is covered by a few tall windmills on a wide road. Under these windmills are a few Item Balloons, which can be collected to gain items. Zippers can also be found under them to give the racers am extra speed boost. Trees are located around the road, however, they are not much of a hazard for players, as they are small and spaced apart. The track soon curves downwards into an area surrounded by water. On the way down, players can find a group of Item Balloons, as well as a Zipper for pilots. The area surrounded by water is covered by two small trees, which are unlikely to cause any harm to experienced racers. A tunnel can be found at the end of this area, which has a few turns in it. In the outside of this tunnel, a few Item Balloons can be found just before a Zipper. This Zipper can boost players to another windmill. A car Zipper is in the windmill for drivers, while a few Item Balloons can be found outside of the windmill for pilots. Right after the windmill is a small tunnel leading to another area surrounded by water. The track can be a little tricky for drivers to get through, as it is quite thin and is filled with some twists and turns. A few trees can also block their way. For pilots, a Zipper can be found high in the air for a speed boost, leading players into a small valley. This valley is rather plain, but has a few Item Balloons floating around. Eventually, racers can come up to a wider area, filled with several trees, as well as a car and plane Zipper. Another long tunnel is at the end of this area. It is filled with no obstacles. Outside of this final tunnel, the finish line can be seen. Heading straight down the pathway can take the racers through it. Like the other levels of Diddy Kong Racing and Diddy Kong Racing DS, Windmill Plains is filled with eight Silver Coins, scattered all around the area. However, the coins only appear once the player has beaten the world's boss at least once. Many of the coins in Windmill Plains are off-road, making the challenge increasingly difficult. 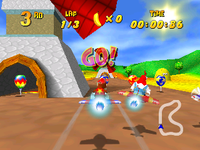 In the first windmill in the track, the player can find the first coin. The next coin can be found inside of a small tunnel in the second windmill. After hitting the first Zipper, the racers can find another coin floating above the track before a large tunnel. The fourth coin is located in the first long tunnel. Upon exiting the first tunnel, a windmill can be seen. The fifth coin is in this windmill. Soon after the fifth coin, players enter an area filled with water. Inside a waterfall here, the next coin can be found. After the sixth coin, the track leads the racers through a narrow valley, where another coin can be collected. The final coin is located to the left of the last Zipper. This page was last edited on April 8, 2019, at 02:37.